Logi-Escalier-Professionnel is the new tool in the LOGIBOIS range, developed with the latest technologies, it will allow you to easily create many types of stairs. - Straight stairs, with one or two turning quarters to the right or left. 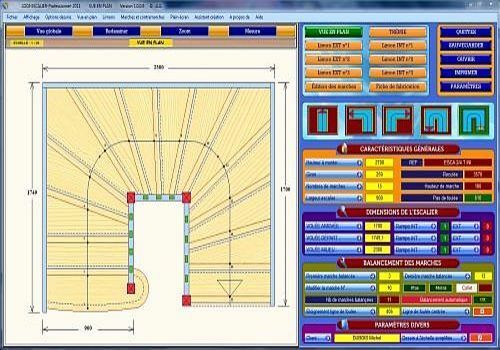 The modern graphical interface makes your drawings more attractive, you can visualize the plan view, the development of stringers with or without barrier, steps and risers, the staircase hopper with floor barriers and head-on calculation, the edition of the flow sheet. Several editing modes allow a different display of your project, the multi-view mode (display of the plan view with the editing of balanced steps for example), the full screen mode, the ZOOM mode to refine manufacturing details and measure elements with the mouse, the Print Preview mode displaying the drawing with its cartridge. - LogiEscalier-Professionnel also benefits from intuitive help, in order to guide the user through the many parameters of a staircase. You can design the stairs in your own way with automatic or personalized step swinging, stride line movement, configuration of all staircase parts (stringboard, post, step, riser, handrail, balustrade...)... etc), the modification of the total number of steps, the number of balanced steps (beginning and end), the tread, the size of each flight of stairs. With the 2012 version, calculate the price of your stairs precisely and make all your calculations faster. Version 2.0.10 has switched to turbo mode, no more waiting between each view, the display is immediate. The reference for architectural design software, with tools that optimize documentation and collaboration. With my 3D bathroom, you can design your bathroom virtually with a selection of furniture available in Leroy Merlin stores. Ashampoo Home Designer is a Windows software that allows you to design your home or apartment on your computer. It offers you many intelligent tools to create quality plans. In Situ is a professional interior design software. This powerful tool will allow you to decorate and arrange any room in 3D! A Windows Store software for those who want to easily draw apartment or house plans.